This Benjamin Franklin letter is from a series of letters he wrote about his studies of electricity. The letters were put together in a book by Peter Collinson, a friend who lived in London and was a member of the Royal Society. Collinson called the book "Experiments and Observations on Electricity Made at Philadelphia in America". It was reproduced more than any other book in the eighteenth century, making Franklin a household name. 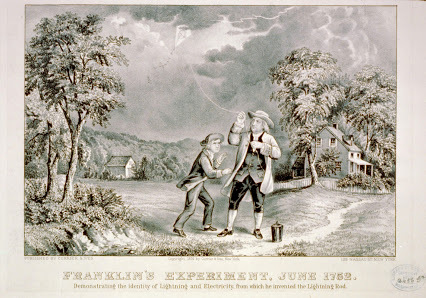 In this particular letter, Franklin gives 56 observations about how electricity flows through the air in a thunderstorm. You can read the other letters in the series at our Benjamin Franklin and Electricity letters page. Observations and Suppositions towards forming a new Hypothesis for explaining the several Phaenomena of Thunder Gusts. 1. Non-Electrical Bodies, that have Electric Fire thrown into [or on] them, will retain it, 'till other Non-electrics, that have less, approach; and then 'tis communicated by a Snap, and becomes equally divided. 3. Air is an Electric per Se, and when dry, will not [readily] conduct the Electrical Fire; it will neither receive it, nor give it to other Bodies: otherwise, no Body surrounded by Air could be electrified positively and negatively: For should it be attempted Positively, the Air would immediately take away the Overplus; or Negatively, the Air would supply what was wanting. 4. Water being electrified, the Vapours arising from it will be equally electrified; and floating in the Air, in the Form of Clouds, or otherwise, will retain that Quantity of Electrical Fire, 'till they meet with other Clouds or Bodies not so much electrified; and then will communicate as before mentioned. 5. Every Particle of Matter electrified is repell'd by every other Particle equally electrified. Thus the Stream of an artificial Fountain, naturally dense and continual, when electrified will separate and spread in Form of a Brush; every Drop endeavouring to recede from every other Drop; but on taking out the Electrical Fire, they close again. 6. Water being strongly electrified, (as well as when heated by common Fire) rises in Vapours more copiously: the Attraction of Cohesion among it's Particles being greatly weakened by the opposite Power of Repulsion introduced with the Electrical Fire. And when any Particle is by any Means disengaged, tis immediately repell'd and so flies into the Air. 7. Particles situated as A and B are more easily disengaged than C, and D, as each is held by Contact with three only; whereas C and D are each in Contact with nine. When the Surface is in Motion, Particles are continually pusht in this Situation. 8. Friction between a Non-Electric and an Electric per Se, will produce Electrical Fire; not by creating but collecting it: For it is equally diffused in our Walls, Floors, Earth, and the whole Mass of Common Matter. Thus the whirling Glass Globe, during it's Friction against the Cushion draws Fire from the Cushion, the Cushion is supply'd from the Frame of the Machine, that from the Floor on which it stands. Cut off the Communication by thick Glass or Wax, placed under the Cushion, and no Fire can be produced, because it can not be collected. 9. The Ocean is a Compound of Water a Non-Electric, and Salt an Electric per Se. 10. When there is a Friction among the Parts near it's Surface, the Electrical Fire is collected from the Parts below. It is then plainly visible in the Night. It appears at the Stern and in the Wake of every sailing Vessel; every Dash of an Oar shews it, and every Surf and Spray: In storms, the whole Sea seems on Fire. The detacht Particles of Water, then repelled from the Electrified Surface continually carry off the Fire as it is collected; they rise and form Clouds, and those Clouds are highly electrified, and retain the Fire, 'till they have an Opportunity of communicating it. 11. The Particles of Water rising in Vapour, attatch themselves to Particles of Air. 12. The Particles of Air are said to be hard, round, separate and distant from each other; every Particle strongly repelling every other Particle; whereby they recede from each other, as far as common Gravity will permit. 14. In Air comprest, these Triangles are smaller; in rarified Air they are larger. 15. Common Fire joyned with Air, increases the Repulsion, enlarges the Triangles, and thereby makes the Air specifically lighter. Such Air among denser Air will rise. 16. Common Fire. as well as Electrical Fire, gives Repulsion to the Particles of Water, and destroys their Attraction of Cohesion; Hence common Fire, as well as electrical Fire assists in raising Vapours. 17. Particles of Water having no Fire with them, mutually attract each other. Three Particles of cold Water then, being attatcht to the three Particles of a Triangle of Air; would by their mutual Attraction, operating against the Air's Repulsion, shorten the Sides and lessen the Triangle; whereby that Portion of the Air being made denser, would sink to the Earth with it's Water, and not rise to contribute to the Formation of a Cloud. 18. But if every Particle of Water attatching itself to Air, brings with it a Particle of common Fire: the Repulsion of the Air being assisted and strengthned by the Fire, more than obstructed by the mutual Attraction of the Particles of Water, the Triangle dilates, and that Portion of Air becoming rarer and specifically lighter, rises. 19. If the Particles of Water bring Electrical Fire when they attach themselves to Air, the Repulsion between the Particles of Water electrified, joyns with the natural Repulsion of Air, to force it's Particles to a greater Distance, whereby the Triangles are dilated, and the Air rises, carrying up with it the Water. 20. If the Particles of Water bring with them Portions of both Sorts of Fire, the Repulsion of the Particles of Air is still more strengthned and encreased, and the Triangles further enlarged. 21. One Particle of Air may be surrounded by 12 Particles of Water of equal Size with itself, all in contact with it; and by more added to those. 22. Particles of Air thus loaded, would be drawn nearer together by the mutual Attraction of the Particles of Water, did not Fire common or electrical assist their Repulsion. 23. If Air thus loaded be comprest by adverse Winds, or by being driven against Mountains &c. or condensed, by taking away the Fire that assisted it in Expanding, the Triangles, contract, the Air with it's Water will descend as a Dew: or, if the Water surrounding one Particle of Air, comes in Contact with the Water surrounding another, they coalesce, and form a Drop, and we have Rain. 24. The sun Supplies, (or seems to supply) common Fire to all Vapours, whether raised from the Earth or Sea. 25. Those Vapours, which have both common and electrical Fire in them, are better supported in the Air; and may be longer supported than those which have only common Fire in them. For when the Vapours rise into the coldest Regions above the Earth, the Cold will not diminish the Electrical Fire, if it doth the common. 26. Hence Clouds form'd by Vapours raised from fresh Waters within Land, from growing Vegetables, moist Earth &c. more speedily and easily deposite their Water, having but little Electrical Fire to repel and keep the Particles separate. So that the greatest Part of the Water rais'd from the Land, is let fall on the Land again; and the Winds blowing from the Land to the Sea are dry; there being but little Use for Rain on the Sea; and to rob the Land of it's moisture, in Order to rain on the Sea, would not appear reasonable. 27. But Clouds form'd by Vapours, raised from the Sea, having both Fires, and particularly a great Quantity of the Electrical, support their Water Strongly, raise it high; and, being moved by the Winds, may bring it over the Middle of the broadest Continent, from Middle of the widest Ocean. 28. How these Ocean Clouds, so strongly supporting their Water, are made to deposite it on the Land, where 'tis wanted, is next to be considered. 29. If they are driven by Winds against Mountains, those Mountains being less electrified attract them; and on Contact, take away their Electrical Fire (and being cold their common Fire also). Hence the Particles close towards the Mountains and towards each other. If the Air was not much loaded, it only falls in Dews on the Mountain Tops and Sides, forms Springs, and descends to the Vales in Rivulets, which united make larger Streams and Rivers. If much loaded, the Electrical Fire is at once taken from the whole Cloud, and in leaving it, flashes brightly and cracks loudly; The Particles instantly coalescing for Want of that Fire, and falling in a heavy Shower. 30. When a Ridge of Mountains thus dams the Clouds, and draws the Electrical Fire from the Cloud first approaching it; That which next follows, when it comes near the first Cloud now deprived of it's Fire, flashes into it, and begins to deposite it's own Water: The first Cloud again flashing into the Mountains. The third approaching Cloud, and all the succeeding ones, acting in the same Manner as far back as they extend, which may be over many hundred Miles of Country. 31. Hence the continual Storms of Rain, Thunder and Lightning on the East Side of the Andes, which running North and South, and being vastly high, intercept all the Clouds brought against them from the Atlantic Ocean by the Trade Winds, and oblige them to deposite their Water: By which the vast Rivers Amazones, La Plata and Oroonoko are form'd, which return the Water again into the same Sea, after it has fertilized a Country of very great Extent. 32. If a Country be plain, having no Mountains to intercept the electrified Clouds, yet it is not without Means to make them deposite their Water. For if an electrified Cloud, coming from the Sea, meets in the Air a Cloud raised from the Land, and therefore not electrified; the first will flash it's Fire into the latter, and thereby both Clouds shall be made suddenly to deposite Water. 33. The electrified Particles of the first Cloud, close when they lose their Fire: the Particles of the other Cloud close in receiving it: in both they have thereby an Opportunity of Coalescing into Drops. The Concussion, or Jerk, given to the Air, contributes also to shake down the Water; not only from those two Clouds but from others near them. Hence the sudden Fall of Rain immediately after a Flash of Lightning. 34. To shew this by an easy Experiment. take two round Pieces of Pastboard, two Inches diameter: from the Center and Circumference of each of them, suspend by fine silk Threads, 18 Inches long, 7 small Balls of Wood (or 7 Peas) equal in Bigness: so will the Balls appending to each Pastboard form equal equilateral Triangles, one Ball being in the Center, and six at equal Distances from that and from each other; and thus they represent Particles of Air. Dip both Sets in Water, and some cohering to each Ball, they will represent Air loaded. Dextrously electrify one Sett, and it's Balls will repel each other to a greater Distance, enlarging the Triangles. Could the Water, supported by the seven Balls, come into Contact, 'twould form a Drop or Drops so heavy as to break the Cohesion it had with the Balls, and so fall. Let the two sets of Balls then represent two Clouds, the one a Sea Cloud electrified, the other a Land Cloud. Bring them within the Sphere of Attraction, and they will draw towards each other, and you will see the separated Balls close thus; The first electrified Ball that comes near an unelectrified Ball by Attraction, joyns it, and gives it Fire; instantly they separate, and each flies to another Ball of it's own Party, one to give and the other to receive Fire, and so it proceeds thro both Sets, but so quick as to be in a Manner instantaneous. In the Collision they shake off and drop their Water which represents Rain. 35. Thus when Sea and Land Clouds would pass at too great a Distance for the Flash, they are attracted towards each other 'till within that Distance: For the Sphere of Electrical Attraction is far beyond the Distance of Flashing. 36. When a great Number of Clouds from the Sea, meet a Number of Clouds raised from the Land, the Electrical Flashes appear to Strike in different Parts; and as the Clouds are jostled and mixed by the Winds, or brought near by the Electrical Attraction, they continue to give and receive Flash after Flash, till the Electrical Fire is equally diffused. 37. When the Gun Barrel, in Electrical Experiments, has but little Electrical Fire in it, you must approach it very near with your knuckle, before you can draw a Spark. Give it more Fire, and it will give a Spark at a greater Distance. Two Gun Barrels united, and as highly electrified, will give a Spark at a still greater Distance. But if two Gun Barrels electrified will strike at two Inches Distance, and make a loud Snap; to what a great Distance may 10,000 Acres of Electrified Cloud strike and give its Fire, and how loud must be that Crack! 38. It is a common Thing to see Clouds, at different Heights, passing different Ways, which shews different Currents of Air, one under the other. As the Air between the Tropics is rarified by the Sun, it rises, the denser Northern and Southern Air pressing into it's Place. The Air so rarified and forced up, passes Northward and Southward, and must descend in the Polar Regions, if it has no Opportunity before, that the Circulation may be carried on. 39. As Currents of Air, with the Clouds therein, pass different Ways, 'tis easy to conceive, how the Clouds passing over each other, may attract each other, and so come near enough for the electrical Stroke; and also how Electrical Clouds may be carried within Land very far from the Sea, before they have an Opportunity to strike. 40. When the Air, with it's Vapours raised from the Oceans between the Tropicks comes to descend in the Polar Regions, and to be in Contact with the Vapours arising there: the Electrical Fire they brought begins to be communicated, and is seen in clear Nights, being first visible where it is first in Motion, that is, where the Contact begins, or in the most Northern Part; from thence the Streams of Light seem to shoot Southerly, even up to the Zenith of Northern Countries. But tho' the Light seems to shoot from the North Southerly, the Progress of the Fire is really from the South Northerly; it's Motion begining in the North being the Reason that it is there first seen. For the Electrical Fire is never visible but when in Motion, and leaping from Body to Body; or from Particle to Particle thro' the Air. When it passes through dense Bodies 'tis unseen. When a Wire makes Part of the Circle, in the Explosion of the Electrical Phial, the Fire tho' in great Quantity, passes in the Wire invisibly. But in passing along a Chain, it becomes visible as it leaps from Link to Link. In passing along Leaf Gold Gilding 'tis visible: For the Leaf Gold is full of Pores. Hold a Leaf to the Light, and it appears like a Net; and the Fire is seen in it's Leaping over the Vacancies. And as when a long Canal fill'd with still Water, is opened at one End in Order to be discharg'd; the Motion of the Water begins first near the opened End, and proceeds towards the close End, tho' the Water itself moves from the close towards the opened End. So the Electrical Fire discharg'd into the Polar Regions, perhaps from a thousand Leagues Length of vapourized Air, appears first, where tis first in Motion, i.e. in the most Northern Part, and the Appearance proceeds Southward, th'’ the Fire really moves Northward. Sometimes the Case may be, that electrified Vapours arising from the Polar Ocean (for Cold is no Hindrance to Electrical Operations) may meet with great Quantities of unelectrified Vapours brought by the Southern Currents of Air from the Continents in warmer Climes. Then the Fire on Contact, must proceed from North to South, thro' those unelectrified Vapours, and would appear so. But if any Part of the Northern electrified Vapours, from which they receive their Fire, are above the Horizon of the Place, from whence the Lights are seen, some Flashes from the Place of Meeting would appear to shoot Northerly, for the Reasons before mentioned. Perhaps the Suppositions contained in this Section, may help to account for some of the Phaenomena of the Aurora Borealis. 41. When there is great Heat on the Land in a particular Region, the Sun having shone on it perhaps several Days, while the Surrounding Countries have been screened by Clouds, the lower Air is rarified and rises, the cooler denser Air above descends; the Clouds in that Air meet from all Sides, and joyn over the heated Place; and if some are electrified, others not, Lightning and Thunder succeed, and Showers fall. Hence Gusts after Heats, and cool Air after Gusts; the Water and the Clouds that bring it, coming from a higher and therefore a cooler Region. 42. An Electrical Spark drawn from an irregular Body at some Distance is scarce ever strait, but shews crooked and waving in the Air; So do the Flashes of Lightning; the Clouds being very irregular Bodies. 43. As electrified Clouds pass over a Country, high Hills and high Trees, lofty Towers, Spires, Masts of ships, Chimneys &c. as so many Prominences and Points, draw the Electrical Fire, and the whole Cloud discharges there. 44. Dangerous therefore is it to take Shelter under a single Tree during a Thunder Gust. It has been fatal to many, both Men and Beasts. 45. It is safer to be in the open Field for another Reason. When the cloaths are wet, if a Flash, in it's Way to the Ground, should strike your Head, it will run in the Water over the Surface of your Body; whereas if your Cloaths were dry, it would go thro' the Body. Hence a wet Rat can not be kill'd by the exploding Electrical Bottle, when a dry Rat may. 46. Common Fire [i.e. Culinary] is in all Bodies more or less, as well as Electrical Fire. Perhaps they may be different Modifications of the same Element; Or they may be different Elements. The latter is by some suspected. 48. When Electrical Fire strikes through a combustible Body, it acts upon the common Fire contain'd in it, and puts that Fire in Motion; and if there be a sufficient Quantity of each Kind of Fire, the Body will be enflamed. 49. When the Quantity of common Fire in the Body is small, the Quantity of electrical Fire, or the Electrical Stroke, should be greater: If the Quantity of common Fire be great, less Electrical Fire suffices, to produce the Effect. 50. Thus Spirits must be heated before we can fire them by the Electrical Spark. If they are much heated, a small Spark will do; if not the Spark must be greater. 51. 'Till lately we could only fire warm Vapours, but now we can burn hard dry Resin. And when we can procure greater Electrical Sparks, we may be able to fire, not only unwarmed Spirits as Lightning does, but even Wood, by Giving a sufficient Agitation to the common Fire contained in it, as friction we know will do. 52. Sulphureous and inflammable Vapours arising from the Earth are easily kindled by Lightning. Besides what arise from the Earth, such Vapours are sent out by Stacks of moist Hay, Corn or other Vegetables, which heat and reek. Wood rotting in old Trees or Buildings does the same: such therefore are easily and often fired. 53. Metals are often melted by Lightning; tho' perhaps, not from Heat in the Lightning nor altogether from agitated Fire in the Metals. For as whatever Body can insinuate itself between the Particles of Metal, and overcome the Attraction by which they cohere (as sundry Menstrua can) will make the solid become a Fluid, as well as Fire yet without heating it: So the Electrical Fire, or Lightning, creating a violent Repulsion between the Particles of the Metal it passes thro', the Metal is fused. 54. If you would by a violent Fire melt off the End of a Nail which is half driven into a Door; the Heat given the whole Nail before a Part would melt, must burn the Board it sticks in; and the melted Part would burn the Floor it dropt on. But if a Sword can be melted in the Scabbard, and Money in a Mans Pocket, by Lightning, without burning either; it must be a cold Fusion. 56. If the foregoing Hypothesis be a true one there ought to be but little Thunder and Lightning far at Sea, or in the Islands remote from the Continent. On Enquiry, the Writer has been informed by an old Sea Captain, that they seldom meet with it on the great Ocean, till they come into Soundings. And an intelligent Person, who lived 13 Years at Bermudas, and many years at South Carolina, says, That he has observed more Thunder and Lightning in one Month at the latter Place, than happened during the whole Term of his living at the Former.